A Food Pyramid is basically a guideline that gives an idea of different food groups that our body requires. 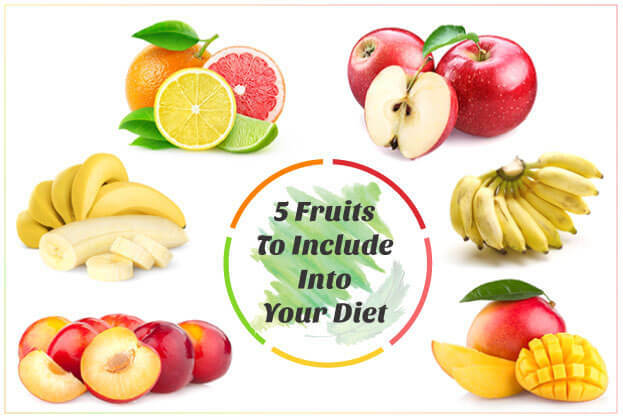 It is a representation of a balanced diet that we should essentially follow in order to provide our body with all the major as well as minor nutrients. 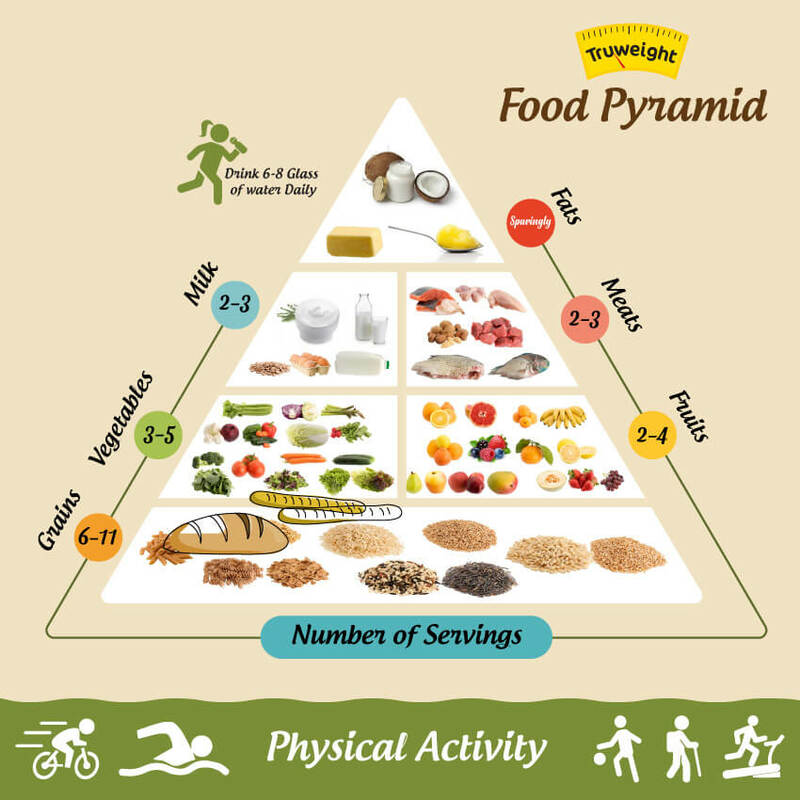 The idea of establishing a food pyramid came up from the United State Department of Agriculture in order to give its citizen an outline of their food choices. In the year of 1992, the food pyramid was introduced by the United States Department of Agriculture (USDA) with the help of researched nutritional knowledge that was updated in 2005 and then was replaced by MyPlate in 2011. It comprises of the grains that are of utmost importance. Consumption of whole grains improves diet quality and is associated with reduced risk of cardiovascular diseases and type 2 diabetes. Additionally, whole grains help in weight management and improves gastrointestinal health. Whole grains such as quinoa, barley, and millet are power packed with abundant health benefits. 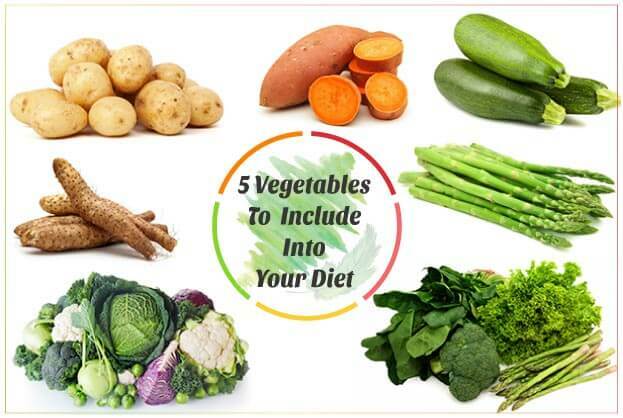 It comprises of vegetables and fruits that are required by our body every day. Including these into your diet will give you the required amount of vitamins and minerals in your daily diet. Fruits and vegetables are the sources of vitamin A, C, and E, magnesium, zinc, phosphorous as well as folic acid. They are rich in antioxidants, flavonoids, and dietary fiber. The flavonol-rich apples are found to be able to reduce risks of developing pancreatic cancer. The phyto-nutrients can also help in reducing the risks of diseases like high blood pressure, diabetes and cardiovascular diseases. Oranges, grapefruits, mandarins, and limes- They contain flavonoids that are good in fighting various cancers. The flavonoids in them also help in the blood flow through arteries.The citrus fruits are extremely rich in Vitamin C that helps in protecting the body from free radicals that damage the body cells. Nectarines, apricots, peaches, and plums- Stone fruits are rich in Vitamin C as well as beta-carotene that helps in protecting eyesight. These also contain catechins that reduce body inflammation. Bananas and mangoes- Mangoes are good sources of Vitamin C and have a low GI that helps diabetic people. 12% of your fiber and potassium needs per day, and 10% of copper and biotin requirements. Know more about Banana nutrition here! They are good sources of fibre and contain antioxidants that help in reducing cholesterol and glucose levels. And that’s not all, berries are packed with vitamins and minerals which help in weight loss. Don’t believe? Read on to discover the health benefits of berries. They are low in fat, are high sources of dietary fibre, contain folic acid, vitamin c, potassium, magnesium, and phytochemicals. They are helpful in fighting cancer, heart diseases as well as diabetes. Cucumbers keep the body hydrated, flushes out toxins, contains vitamins and minerals and also help in weight loss. Zucchini contains vitamin A, magnesium, folate, potassium, copper and phosphorus. It is also a rich source of omega-3 fatty acids. These are the sources of vitamins C, E, and K, folate, minerals, and carotenoids. Potatoes are rich in vitamin B6 and have high amounts of potassium and magnesium. Sweet potatoes are high in vitamin A, vitamin B5, B6, thiamin, niacin, riboflavin, and carotenoids. Yams are good sources of Vitamin C, fiber, potassium, manganese, and metabolic B vitamins. They are good for colds and flu, bones and immune system. Want to try out a sweet potato recipe? Here it is. It contains milk products, meats, nuts and seeds. Milk contains proteins, carbohydrates, minerals and fat that are required by our body. The calcium, vitamin D, phosphorous present in milk and milk products give stronger bones and the vitamin A is good for the immune system. Meats and fishes are important protein sources and are definitely required by our bodies. Nuts and seeds are powerhouses of vitamins, minerals, and good fat. Nuts and seeds are rich in fiber, plant proteins and minerals like magnesium, zinc, calcium, and phosphorus. Can’t find ways to include the goodness of seeds in your daily diet? Try out Truweight’s Seed Cocktail today! Here’s a quick recipe with the goodness of Truweight’s Seed Cocktail. It comprises of ghee, and coconut oil, fats, and sweets that are to be consumed in a low percentage. The fats that you consume should be coming from fishes, vegetable oils or nuts. Keeping the portions limited and avoiding the solid fats sources like butter is advisable. 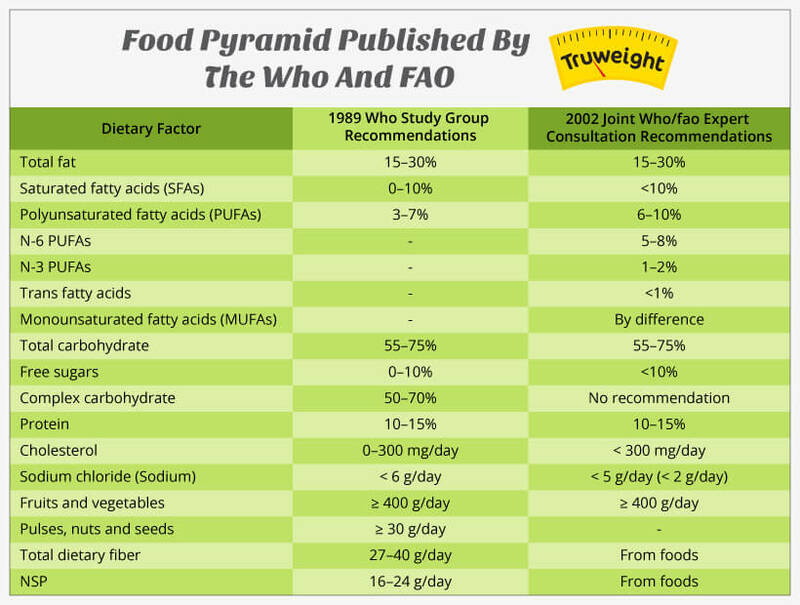 The Dietary factors and recommendations in a food pyramid published by the WHO and FAO are shown below. While we saw the basic arrangement of a food pyramid, there are certain salient features that form the basic structure of this pyramid. Eat more veggies and fruits by including salads and whole fruits into your diet. Ensure that the diet is not monotonous Try to sneak in all the food groups into your meal plans. Remember, it is always important to maintain a balanced diet instead of any restricted diet plan. Always drink enough water throughout the day. Keep the amount of oil and fat in your diet very low. 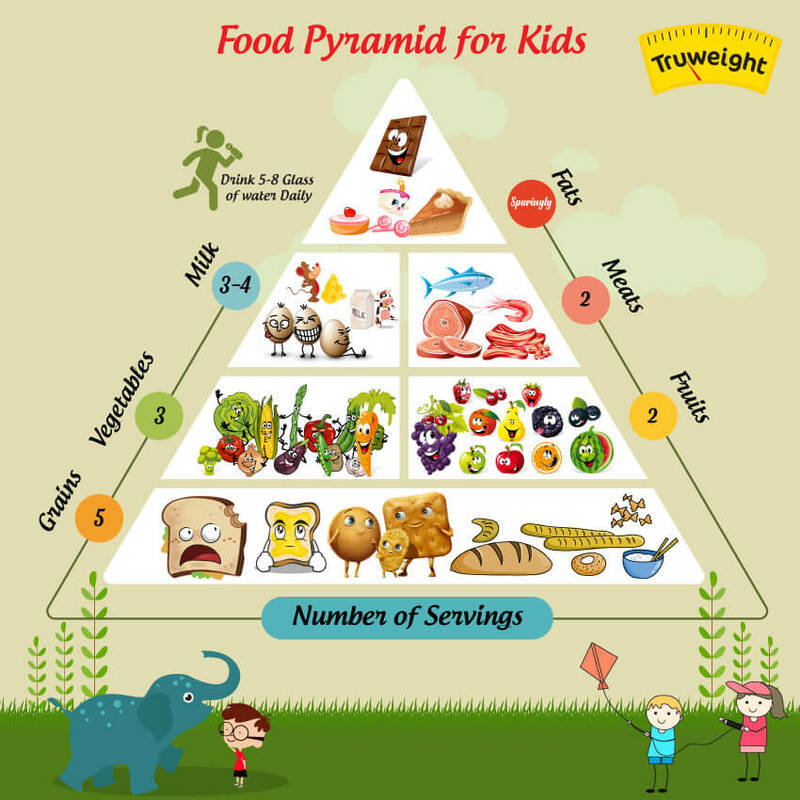 The basic food arrangement in the food pyramid remains similar even for a food pyramid for kids. The importance of food pyramid is that it gives a basic idea of our everyday nutrient requirements through a simple graphical representation. A food pyramid encompasses various food groups that we need to include. It represents a balanced diet with required proportions that a person requires for an optimal health. The food pyramids may differ based on countries and region depending upon many factors like environment, culture and available foods. The main aim of any food pyramid is to diagrammatically depict a balanced diet that includes all the required food groups into our diet. To guide you more into forming a diet plan that specifically suits your health conditions, consult a Truweight Nutritionist today. The best part, the first consultation is on us! Click here to avail the offer.